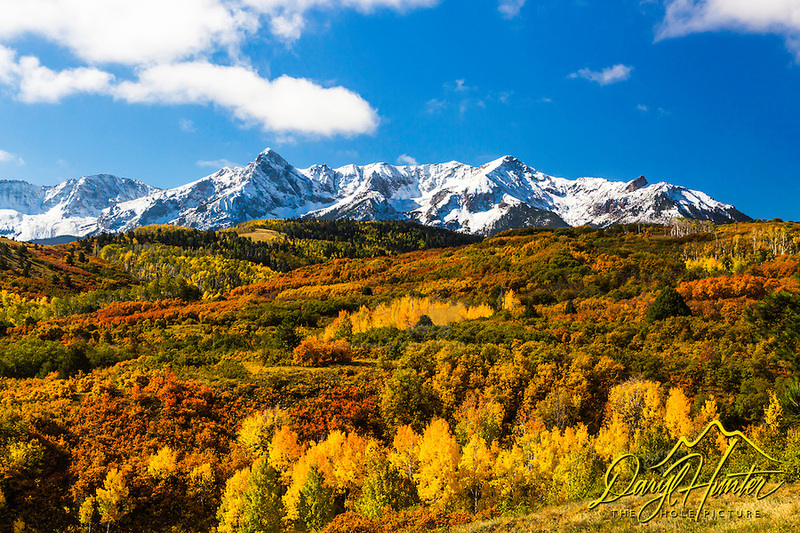 Autumn snow at Dallas Divide in Colorado's San Juan Mountains outside of Ridgeway. This iconic vantage point of the San Juan Mountains is iconic for a reason, I love the layers and depth of the landscape. Many of the photographers around were bemoaning the fact that this was short of "Peak Color". Peak color? A dozen years ago I had an epiphany. Why do we dislike "green" in autumn? I have come to appreciate green in the mix of the warm colors of autumn, the more color, the better I like it. A panoply of color for my photographers palate is a good thing. While in the San Juan Mountains I shot several different vantage points along Dallas Divide, but this was the best. The red of the scrub oak was very additive as was the green of the aspens that had not yet changed.